Since the 1976 case of Karen Ann Quinlan, end-of-life decision making has become complex and nearly overwhelming, considering the many life extending procedures to be considered and the prevalence of medical conditions such as dementia that reach beyond the "terminal" and "irreversibly unconscious" triggers specified in most advance directives. Most states' advance care planning laws and forms were created 30 to 40 years ago. Some have been amended to reflect contemporary treatment options and to allow the expression of individual care preferences. Most have not. In doing research for her 2015 book, The practical guide to Health Care Advance Directives, it became obvious to attorney Jo Kline that almost all advance directive forms continue to be difficult and confusing to complete and do not accurately reflect the care wishes of the future patient. What good are instructions that are not accurately communicated to the patient's proxy and health care providers? The Health Care Advance Directives offered here are the product of Jo's research, writing and teaching about end-of-life decision making for over a decade. 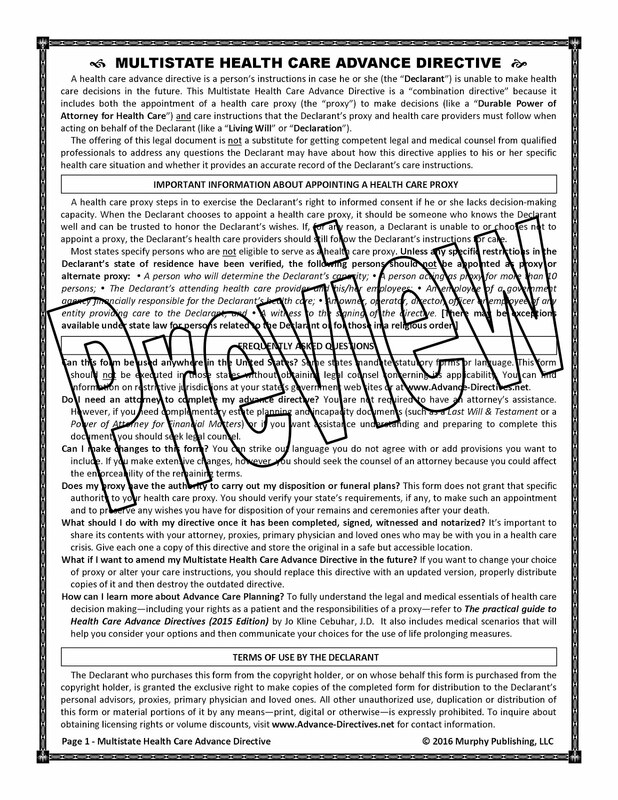 The Multistate version is meant to be used throughout the United States, subject to the restrictions detailed on the "MULTISTATE Directive" page. Most importantly, these advance directives are easily understood by the Declarant as well as those entrusted to act as the Declarant's advocates. Effective January 1, 2016, Medicare benefits include patient-physician Advance Care Planning during an annual wellness visit or at a separate appointment (with coinsurance). The right time to make a plan for managing health care and end-of-life care is while you still can. The time is now.